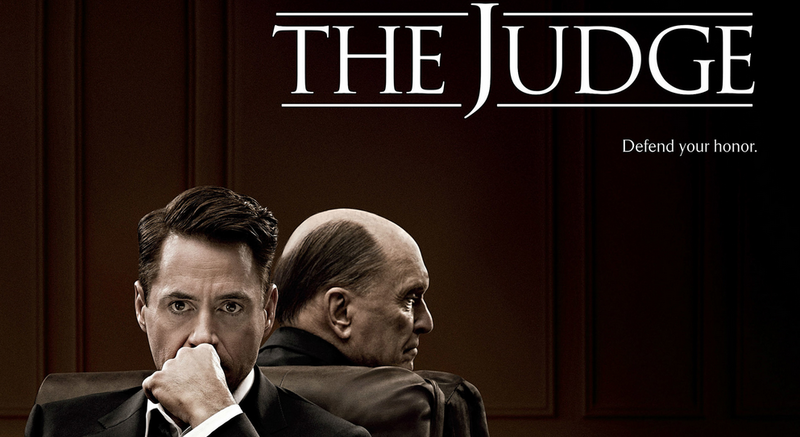 David Dobkin’s most recent directorial offering, The Judge, is the kind of film narrative that is most often reserved for melodramatic films about the complicated love hate relationship between a mother and daughter, as stubborn and unforgiving as one another. In this instance, the gender roles have been reversed and we have Robert Downey, Jr. and Robert Duvall starring as the members of a strained familial partnership. Many of the narrative elements are familiar to this type of picture, an urbanised, newly successful offspring is forced to return to their rural roots and confront the age old quarrel that has persisted between them and their parent, with plenty of secrets to reveal and home truths to face. In a potentially refreshing turn of events, however, The Judge just happens to involve a murder trial in which son must defend father for the future and integrity of their family name. Downey, Jr. plays Hank Palmer, a successful Chicago lawyer who plies his trade defending the guiltiest of the guilty and making many ethical enemies along the way. Upon hearing the news of the death of his mother, Hank is forced to travel back to his home town of Carlinville, Indiana and has no choice but to reunite with his stern, bristly father, town Judge Joseph Palmer (Duvall). With the funeral over and tensions at boiling point, Hank makes to leave but is called back after the discovery that his elderly father has been arrested and charged with the vehicular murder of a town citizen, one with whom he may have a concerning history. The film progresses as part courtroom drama, part family based melodrama, and whilst being perfectly enjoyable if not a touch over extended, the problem with The Judge is that it offers very little in terms of originality, with an extremely predictable narrative journey that one would find in any melodramatic TV picture on the wide range of average cable channels around the world. However, the formulaic plot doesn’t make The Judge a completely unwatchable experience, in fact whilst the film may bear narrative similarity to a number of lesser pictures, one element that is clearly very telling of a bigger budget is the overall aesthetic. With many scenes taking place in dark courtrooms and shadow filled houses, the film’s cinematography is one of its shining features. It looks sharp and at times glossy whilst simultaneously feeling rather warm, signifying a perfect amalgamation of the hardboiled courtroom drama and the more personal family drama that is intertwined throughout. Some of the dialogue and humour, too, are enjoyable to watch, with a hint of the fast talking banter of shows like The Newsroom, The West Wing and even Gilmore Girls, but all of these examples are far superior in comparison. Though the story has just enough pull to keep the audience interested, at two hours and twenty minutes in length, even the strictest patience begins to be tested, and this could be a consequence of the overdone, overseen formulaic plot that really holds the film back from becoming something more memorable. Though The Judge has many narrative problems, the stellar line up of the cast is something that is unquestionably impressive. Robert Downey, Jr. is his charismatic and captivating self as Hank, walking that fine line between confidence and arrogance without ever becoming entirely unlikable to the audience. The sharp, knife edge chemistry he has with Robert Duvall is really the selling point of the picture. Duvall as Judge Palmer is the archetypal proud, stubborn patriarch, making it easy for the audience to understand the duo’s friction yet reserving just a hint of love that evokes both sympathy and empathy and makes the outcome of his struggles something to care about. Interesting supporting roles are given by Vincent D’Onofrio and Jeremy Strong as Hank’s older and younger brothers respectively, there to flesh out the family’s backstory and provide a little light and shade in what could be a very one dimensional family dynamic. Vera Farmiga brings a little life to the screen as Samantha, a long lost local love of Hank’s with whom the audience are eager to see him reunited. Each of these characters seem genuine and authentic, and in truth I would have liked to see each of them developed further, but given the already lengthy running time this sacrifice is understandable. 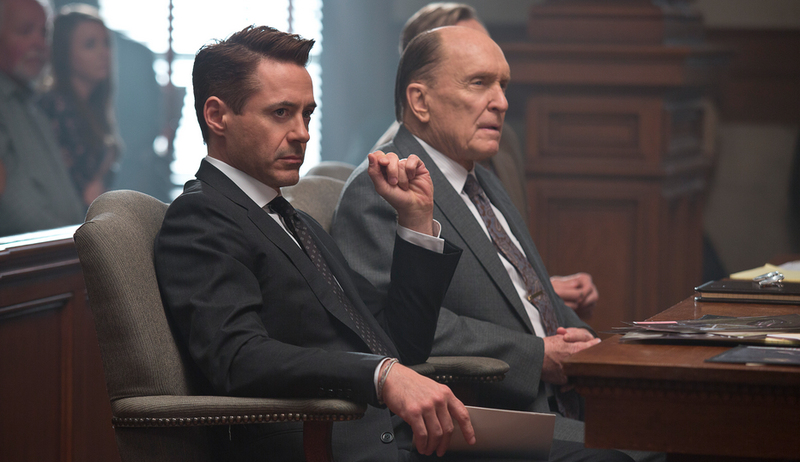 Overall, The Judge is a film that, though solid and well acted, will be forgotten before the end of the year. Downey, Jr. in particular should be praised for his performance, but the picture’s lack of originality will see it disappear from the limelight and enter in to the monotonous late night television rotation that befalls the fate of similar melodramatic family centric pieces. By no means the worst film I have seen this year, but by no means the best. In fact, unfortunately and undeservedly, its inoffensive predictability may just see it forgotten in my mind ahead of far inferior offerings like 300: Rise Of An Empire or Noah. They were bad, but at least they were slightly memorable. ← Oh! That Film Blog’s Podcast Debut!